BookCollector: perfect for the chronic cataloguer | Catalogue This! Considering that this blog is called “Catalogue This!”, I really should start blogging about cataloguing, shouldn’t I? As a bit of an intro, I am a chronic cataloguer. Always have been. This first time I put spine labels on my books, and typed up a bibliography of everything I had, I was just 10 years old. Throughout my teenage years I had Excel spread sheets with the bibliographic information of my collection. I even had a spread sheet for my downloaded movies, (columns included title, year, file runtime, file image quality, language, subtitle language, genre, file type, backup disk number and other notes). Then about 18 months ago, I discovered Collectorz.com, and their software, BookCollector. This software is designed for the private and/or small library. It has a professional-looking interface, can generate (some) reports, it can retrieve bibliographic information from the internet automatically via ISBN, and best of all, it has a loans function. For me, this was the big draw, as now I could keep track of which books my sister had ‘borrowed’ and not returned. While BookCollecector does not follow AACR2 (or any other set of rules), there are fields for including LoC cataloguing number, it’s Dewey, as well as the two ‘User Lookup’ fields. Here, the user can insert additional information (not tags, that has its own field) for search purposes. I use one of the fields for the item’s call number, and the other for its collection (ie. Junior, YA, Adult etc.). The thing about BookCollector is that is allows the user to include as much, or as little information as they wish. There only really needs to be one identifier (title), and from there, even the non-library-schooled can use it. It is also a very affordable piece of software. At around AU$70, even a broke student (like myself) can afford it. And if you are not sure if you really want it. You and use the trial version, which allows you to catalogue 100 items. By the time you reach 100 items, you should know if you like the software or not. Plus, you can purchase one of a number of barcode scanners, so increase the speed of providing the ISBN so the internet can do the cataloguing for you. If you are like me, and have a huge backlog to get through, this can be a life saver! So yeah. 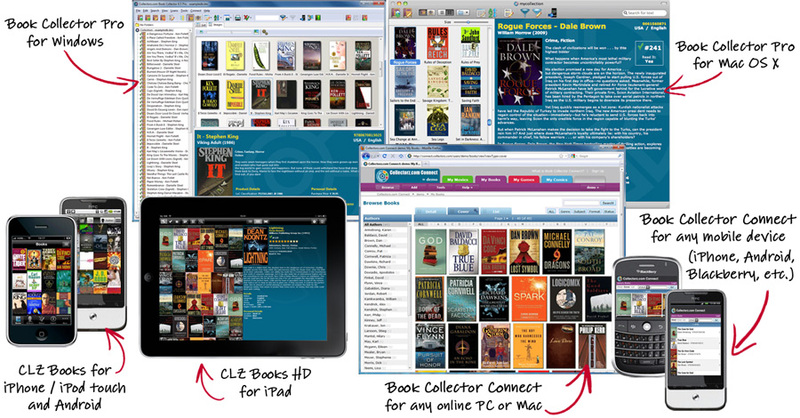 Try out Book Collector. You will be glad you did.